Family owned 3 bed caravan sleeps 4. Fully fitted kitchen with gas cooker (+electric grill) full size fridge/freezer, microwave and washing machine. Lounge area has been refurbished to a high standard, has TV and DVD player. Free standing table and chairs. WiFi is available on the Park. There are 3 bedrooms, 1 beautiful double, 1 large single with 3’ bed and 1 smaller single with 2’6” bed. 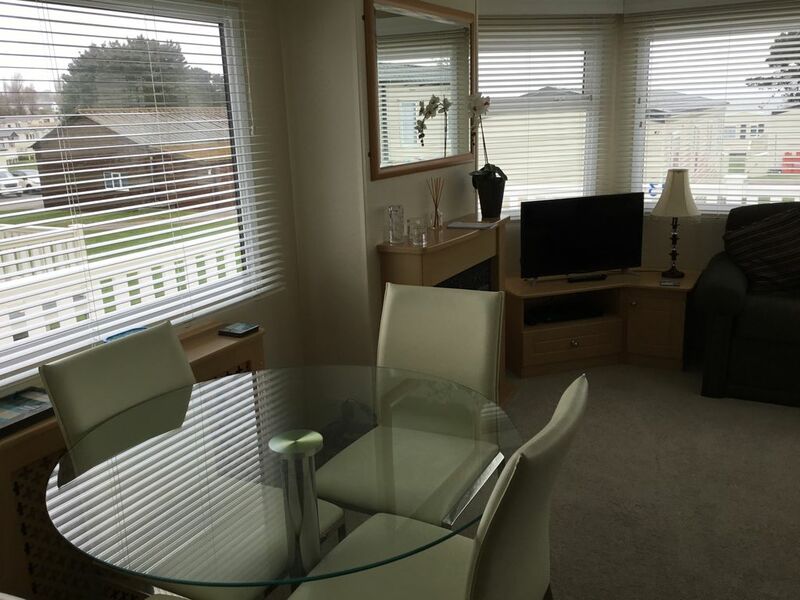 All 3 bedrooms have wardrobes and overhead storage. The shower room is small but perfectly formed, shower has a deep base which is ideal for bathing little ones who do not like showers, W.C. and wash basin there is an additional W.C. + basin too. Large decking area at the front and side of caravan, ideal for leisurely eating , watching the world and ships go by. The Park has a strict no pets rule. Private access to the beach - it is a steep climb but well worth it. The site has a shop and launderette. Duvets and pillows provided, please bring your own bed linen ( duvet cover, sheets, pillowslips) and towels. Family owned, well cared for with extras as standard; washing up liquid , dish cloths, hand soap, loo rolls, kitchen roll. We have found many guests prefer to bring their own bedding. All beds have quality mattresses and it really is a home from home.